What 12 years of early onset dementia taught me about grief, friendship, and myself. My grief started long ago. 2005, to be exact. I was 22, still living with my parents, and spending almost every day having an argument with my mother. Sometimes they were quite vicious. Though I was still yet to start my career, I was close to moving out due to feeling like I was walking on eggshells at home. About two years later, Mum was diagnosed with Pick’s disease — a rare form of frontotemporal dementia. She was only 48 at the time, and her doctor had told her that the mood swings and confusion she had been experiencing over the past couple of years was not related to menopause, but was something rather much more serious. Something that would eat away at her brain until she eventually passed, some time in the next 1 to 15 years, with the average being five. The news was taken hard. This was my mother who, in the prime of her life, had been told that everything she had amounted to, everything that she was, was going to fade away slowly until her brain was so decayed that her entire body would shut down. Grief with dementia is a complicated thing, as it’s almost impossible to grieve someone who is still with you. You feel like you are watching them die over and over again. At first, it’s the change in temperament. Followed by the paranoia, forgetfulness, and then the body starting to fade as well. Do you grieve them when they’ve forgotten your name? No, of course not — they’re still here, and they still smile. Do you grieve them when you have to hand feed them? Why would you? They’re still here and still around for hugs. Do you grieve them when they can no longer speak? Nah — you can still take them outside for walks. My entire life for the past 12 years has had the dark stormy clouds of Mum’s dementia hanging over it. By the time I got used to a new stage of the illness, mum would fall off the cliff to an even worse stage. Yet, during all this time, I felt like I couldn’t grieve, no matter how heavily it weighed upon me. A typical view in the mid-stages, way back in 2011. These videos are taken 3 months apart. As one might imagine, dealing with this for so long was something I couldn’t do alone. The most important thing that kept me going through the dark days was not pity from friends or family. It wasn’t people calling me up to ask how I was handling things. It was something far more simple — being treated like I wasn’t grieving at all. I know that probably sounds weird, but hear me out. When you’re dealing with dementia, it never leaves you. The biggest thing you need to recharge is a distraction, a chance to forget about it all for a little while and enjoy life. Of course, there was the understanding that I could have a vent with my friends any time I needed one. And I took them up on that offer on multiple occasions. But being able to just live life, have fun, and put a smile on my face was something that meant the world to me. It was a glimpse at the life I was supposed to be living. Mum passed away on June 17, just three days before her 60th birthday. The feeling is still raw. The first month I felt like I was purging grief that I had held on to for more than a third of my life. It hurt, but I could also feel it leaving me. 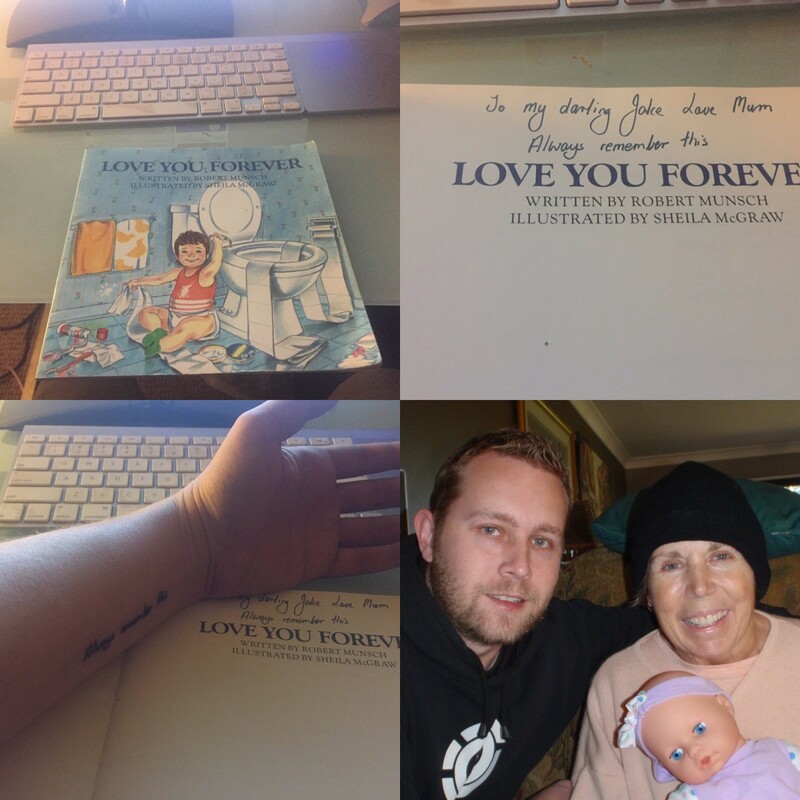 I got Mum’s love for me tattooed on my arm after her passing. The bottom right picture is a doll I bought for her birthday, something that many female dementia patients love to receive as it brings out their motherhood instinct. Now that it’s been over two months since her passing, the biggest thing I regret is that I didn’t take more time to grieve during her illness. It wasn’t until the last year or so that I really felt like it was OK to have a cry and let it out. I feel like I’ve awoken from a 12 year long nightmare. While it still disturbs me on a daily basis, there is so much life out there to live that I had put on hold for so long. Life that my friends showed me. Life that mum would want me to live. In her honour, I will live my life as best as I can. I will smile as bright as I can. I will love as best as I can. Though she forgot who I was many years ago, I will always remember who she was, and who she would want me to be. Always Remember This (A fun little story about early onset dementia) by Jake Heath is available on Amazon. Follow Always Remember This on Facebook.